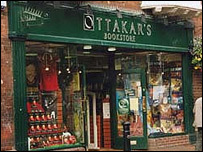 The founders of UK bookstore chain Ottakar's have launched a management buyout bid (MBO) for the company. Managing director James Heneage and chairman Philip Dunne have had their £78.6m offer - 350p a share - accepted by the firm's independent directors. 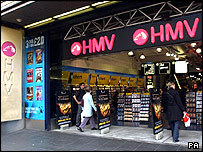 The move comes a day after music, DVD and book retailer HMV confirmed it was in talks to buy Ottakar's. News of the MBO bid could spark a bidding war for Ottakar's. HMV already owns bookseller chain Waterstone's. Some analysts believe HMV may now make a hostile 380p bid for Ottakar's. Mr Heneage and Mr Dunne's Book Store Acquisitions bid vehicle is backed by private equity firm Phoenix Equity Partners. Ottakar's first said last week that an MBO was a possibility. Following the MBO's approval by the firm's independent directors, the wider shareholders will now have to chose whether to accept. It has recently struggled against the growth in supermarkets selling books, and the success of online retailers. Last month Ottakar's blamed supermarkets selling reduced price copies of the new Harry Potter book for a 6.7% drop in same-store sales in the four weeks to 16 July. Despite the firm's current poor performance, it is obvious that Mr Heneage and Mr Dunne are confident about its future. They believe that, with extra investment, the firm's performance can be turned around. If HMV is eventually successful in buying Ottakar's, it is not known how many of the stores will become Waterstone's outlets, and how many HMV stores. Senior independent Ottakar's director Christopher Thornton said the MBO represented a good deal for shareholders. "No proposal has been received from HMV at this time and, in the absence of any other offers or firm proposals, the offer provides shareholders with an immediate and certain opportunity to realise their investment in cash at a material premium to recent values," he said.